Authorities in Brazil and Bolivia carried out a joint operation against a group suspected of international drug trafficking in the latest sign of increasing law enforcement cooperation between Brazil and its cocaine-producing neighbors. Media outlets based in both countries reported that Brazilian and Bolivian federal police forces began on June 29 an initiative called Operation Quijarro, named after the Bolivian port city on the border with the Brazilian state of Mato Grosso do Sul. The drugs allegedly were trafficked through the area in trucks with false bottoms. The operation rounded up 30 suspects by July 1, according to Bolivia’s Opinión newspaper. Brazilian daily Folha de São Paulo reported that authorities also seized three tons of cocaine, around $10 million and several properties that were tied to the trafficking scheme. Police arrested the alleged logistics expert for the trafficking ring, Claudinei de Jesus, according to O Globo. The newspaper reported that the investigation, which began in January 2015, focused on a group operating in the Brazilian city of Londrina that had connections in Bolivia, Colombia and Spain. Several news outlets reported that Operation Quijarro once again landed the messaging application WhatsApp in hot water with the Brazilian justice system. A court in the state of Paraná ordered a freeze on $6.1 million worth of assets belonging to WhatsApp’s parent company, Facebook, in response to the firm’s failure to cooperate with the investigation. Brazilian judges have previously ordered nationwide suspensions of WhatsApp’s services for similar reasons, and in one case a Facebook executive was briefly detained on a judge’s orders. As InSight Crime has previously reported, free speech advocates and users of the highly popular messaging service have strongly criticized these actions, while WhatsApp has defended its position by claiming the company “cannot provide information we do not have” because messages sent through the app are not stored on the company’s servers. Operation Quijarro is the latest example of deepening cooperation between Brazil and its neighbors on efforts to combat organized crime and the drug trade. 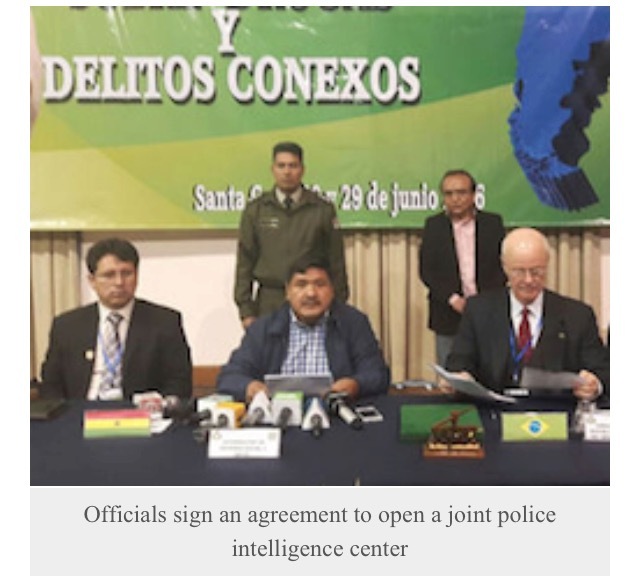 Providing further evidence of this trend, Brazilian, Peruvian and Bolivian officials met in the Bolivian city of Santa Cruz de la Sierra on June 29 to sign an agreement for the creation of a trilateral police intelligence center that will focus on combatting drug trafficking in those three countries. Earlier this year, the Brazilian, Peruvian and Colombian militaries conducted a joint military exercise in the Amazon border region aimed at improving the armed forces’ ability to cooperate in the effort against drug trafficking and illegal mining operations. The Brazilian and Colombian militaries have also begun information-sharing efforts that officials say they would like to extend to Bolivia. These efforts are notable because Colombia, Peru and Bolivia — all of which share long, relatively unguarded borders with Brazil — together produce virtually all of the world’s cocaine. Brazil is both the world’s second-largest consumer of that drug as well as the primary transshipment country for cocaine destined for Europe, Asia and Africa. Intraregional cooperation with Bolivia will be particularly important given the country’s rising importance in the regional drug trade, a development detailed by InSight Crime in a recent series of articles. This entry was posted in Bolivia, Crime and Violence, Drug war - narcotraffick, Politics, Social Unrest and tagged demagogue, democracy in peril, international narcotics control board, police and judicial corruption, public policy failures. Bookmark the permalink.